Debut novelist J.J. Gesher tells an intimate, grief-filled story about Jacob Fischer - a sometimes wayward, sometimes obedient Brooklyn Orthodox Jew who breaks down after a devastating loss. Slowly rebuilding and rediscovering himself in a small-town Alabama town, Jacob has support from a cast of well-drawn characters - who also have their own demons to deal with. I loved learning more about the Orthodox Jew and the rich history of its sometimes stifling traditions, butting heads with modern sensibilities and realities. This highly readable title, right down to the very last sentence, is a natural pick for book clubs. A strong debut from the writing pair of J.J. Gesher. Shortly after Orthodox Jewish Brooklynite Jacob Fischer puts his young family on a bus to visit relatives, the bus explodes in a stunning act of terrorism. HIs faith shattered, Jacob flees the comforts of his community and disappears. He lands up in a predominantly black town in rural Alabama, where he meets Rosie, the single mother of a young son. Their developing relationship, along with the rekindling of his love of music, precipitate events that will change both their lives. This debut novel is a powerful page-turner that follows a complex man on a journey of salvation after tragedy. J.J. Gesher is the pen name for co-authors Joyce Gittlin and Janet B. Fattal.Together, Janet and Joyce have completed three feature screenplays and won several prestigious screenwriting awards, including the Geller Prize and the Screenwriting Award at the Austin Film Festival. Their first collaboration was a Lifetime Television movie. 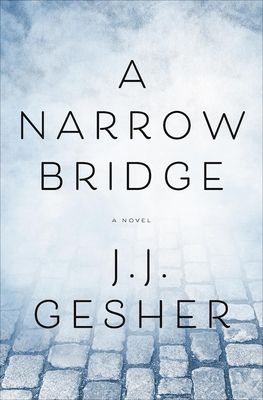 A Narrow Bridge is their first novel. Joyce Gittlin graduated with an MFA from NYU Tisch School of the Arts and spent the next 25 years writing and directing television. Among her many credits are Wings, Frasier, and Everybody Loves Raymond. In addition, she has written more than 10 feature films for Disney, Paramount, and 20th Century Fox. Janet B. Fattal received a masters in Comparative Literature from UCLA and has taught literature and writing at the college level. She has edited several memoirs and written curriculum for high school and college students. Janet shares her passion for literature by leading many book groups, including for the Skirball Cultural Center in L.A., Hadassah, and the Brandeis alumni book club.